A recent advisory ethics opinion addresed whether it is “permissible for an attorney to include an indemnification provision in a retainer agreement at the commencement of representation that requires the client to indemnify the attorney . . . against third party claims that arise from the client’s behavior or negligence?” See Utah Ethics Advisory Opinion Cmte. Op. No. 18-04 (Sep. 11, 2018). Answering the question in the affirmative, the committee advised that the “proposed indemnification provision is not specifically prohibited by the rules.” Id. The committee noted, however, that a lawyer may seek an advance limitation on the lawyer’s liability for malpractice “only if the client is advised in writing of the advisability of and provided the opportunity to seek separate counsel regarding the prospective limitation.” Id. at 3 (citing Utah Rule 1.8(h)(1)). Likewise, such an indemnity provision should not breach the applicable standards of care and conduct governing Louisiana lawyers. Such an agreement can actually serve to implement the duty of loyalty owed by a lawyer to a client by ameliorating the personal interest that the lawyer may have in avoiding personal liability to a third party. 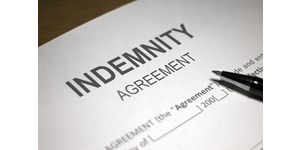 By obtaining indemnity from the client, the lawyer can focus entirely on the interests of the client without the risk of impairment that might exist if the lawyer had to consider the lawyer’s own interest in avoiding claims by nonclients.